Going out to eat at a restaurant can be difficult for any family, but especially for families of individuals with autism. This page was designed to provide you with tips and resources to help make dining out a successful and enjoyable experience for everyone! On Friday, April 13th, the episode of ABC's What Would You Do? featured Lisa Goring, Autism Speaks Vice President of Family Services, and her son Andrew, 15. During the segment, actors playing a family of four, including a boy with autism, were eating in a restaurant, as the cameras looked to capture the responses of fellow customers to behaviours displayed by the boy. One successful strategy when dealing with an unfamiliar routine is to prepare the individual ahead of time. Preparation can greatly reduce anxiety in unfamiliar environments and helps a person know what to expect. - Is it an over-stimulating environment? - Has the individual been there before? - How long will you have to wait for a seat? - What time of day are you going? - Can you make a reservation? - What types of (favourite) foods do they serve? - Can you print the menu out at home? - Have you marked the event as special on the calendar? Do you avoid eating out because you have a child with autism, and it's just too stressful to take him to a restaurant? In this article, SheKnows Parenting provides some tips to help you avoid some common headaches when dining out at a restaurant with an autistic child. In May of 2011, we asked the following question on our blog: The idea of dining out for a person with autism is often daunting. How do you prepare yourself or your child for going to a restaurant? Can you share some positive/negative dining experiences? What strategies do you employ to ensure the best experience possible for you and your family? "My son is 16 and has PDD-NOS. We have always taken him and his 14 year old brother (who has ADHD) out to restaurants with few problems. Major chains have their menus on their websites, which helps to plan ahead." "We’ve also found that sitting at booths with windows looking out helps!" "A relationship with the wait staff really helps. At my son’s favourite places, they know what he wants walking through the door. He is served promptly, with personalized attention and like anyone else, responds positively." "Another “hint” for those of you with Teens on the spectrum. I use “dining out” as a tool for teaching my kiddos to advocate. Since mostly I and they want something customized from the regular menu, this teaches them that it is okay to ask for special stuff and how to do it politely as well as pay for it. I make my teens figure out tips at the end of the meals. :) Good stuff all around." "Things I keep on hand to avoid meltdowns: 1. Bag of snack foods: carrots etc. 2. Fidget toys, 3. Visual cue cards." Click here to read the rest of responses we got from our Topic of the Week. This list of important skills to consider when going out to eat with your child with autism was compiled by Nassau Suffolk Services for Autism. *Note: You will need to tailor these based upon your child's abilities. "A Social Story™ describes a situation, skill, or concept in terms of relevant social cues, perspectives, and common responses in a specifically defined style and format. The goal of a Social Story™ is to share accurate social information in a patient and reassuring manner that is easily understood by its audience. Half of all Social Stories™ developed should affirm something that an individual does well. Although the goal of a Story™ should never be to change the individual’s behaviour, that individual’s improved understanding of events and expectations may lead to more effective responses." Click here to visit The Gray Center website, and learn more about Carol Gray's Social Stories. Pictello is a simple way to create talking photo albums and talking books. Each page in a Pictello Story can contain a picture, up to five lines of text, and a recorded sound or text-to-speech using high-quality voices. Pictello is developed for all ages and skill levels, so it is easy to use and requires no reading skills to locate and read stories. Pictello offers an easy visual story creation wizard so everyone can use pictures and sound to share important moments in their lives. Pictello is a universal app and can, without extra costs, be used on iPhone, iPod touch and iPad! Using visual supports during a meal has many benefits. It can reduce anxiety and makes the activity less overwhelming. Visual supports provide a visual representation of what is going to happen throughout an activity, breaking it down into steps that can be understood by the person. A tool kit from the Autism Treatment Network that introduces parents, caregivers, and professionals to visual supports and provides instruction on how to use them in everyday activities, schedules and tasks. The tool kit provides actual visual supports for parents to print, cut out and use, along with links to resources that provide more detailed information for those who want to go further. Anyone can download the Visual Supports and Autism Spectrum Disorder Tool Kit for free here. Model Me Going Places™ is a great visual teaching tool for helping your child learn to navigate challenging locations in the community. Each location contains a photo slide show of children modeling appropriate behaviour. 6 locations: Hairdresser, Mall, Doctor, Playground, Grocery Store and Restaurant. First-Then visual schedule application is designed for caregivers to provide positive behaviour support. For individuals with communication needs, developmental delays, Autism or those who benefit from a structured environment; visual schedules serve to increase independence and lower anxiety during transitions through different activities. 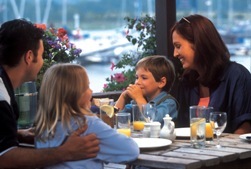 Do you have any other tips for families, or would you like to share your dining out experiences with us? We would love to hear from you! Email us at familyservices@autismspeakscan.ca.